I have been a big fan of Mani Ratnam. I have religiously watched each of his Hindi movies in the first weekend of its release. Right from his first Roja, then Bombay, Dil Se, Yuva, Guru and now Raavan. I have even watched his Tamil classic Nayagan in Chennai. I had some Tamil-speaking friends with me who translated the key dialogues. Not that understanding the dialogues was important, Mani Ratnam’s films have always been lavishly mounted, visually rich and moreover, he is a great story-teller. 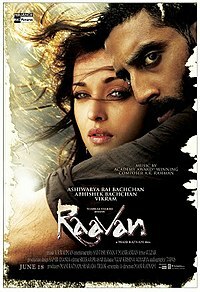 So it was with great expectations I acompanied my family to see Raavan. To say I was disappointed will not be accurate, there was a huge feeling of being let-down by someone who has given good cinema. Let me tell you why. The story is based on Ramayan, Abhishek being Raavan and Aishwarya being Sita. There is a Ram too, Vikram, but more about him later. The film starts with Sita- haran which is stylistically done on a river, Raavan capsizes the boat Sita is travelling in and captures her. The kidnapped Sita tries to jump off the cliff and is saved as a tree breaks her fall. And then nothing happens. Save for some crazy gesticulations of Raavan, and some inane flashbacks of Sita’s past with Ram. Hanuman (Govinda, who else!!) is also introduced. He is the guide to Ram (the local Superintendent of Police) and his army out to rescue Sita and vanquish Raavan. So that is the first half. The second half sees more of inane action. One can see the incipient romance between Raavan and Sita. One is also told about the wrong Raavan trying to avenge. The denoument is reached when Ram and Raavan meet in a dramatically-shot clash on a wooden bridge across two cliffs. Raavan has the chance to kill Ram, but he spares him for the sake of Sita. He also lets Ram return and take her away. In the return journey home Ram questions Sita’s fidelity. He wants her to take a polygraph test (Mani Ratnam’s version of agni-pariksha). Sita would have none of this nonsense and she walks out on Ram and, horror of horrors, takes a bus journey back to her captor! Ram returns, back with his army, searching for Raavan. Sita tries to protect Raavan, she even provides a human shield to him. But eventually Ram manages to shoot down Raavan. There is this slow-motion shot where Raavan is falling after being shot and Sita is desparately trying to hold his hand! And then Raavan plunges down into his watery grave. The problems with the movie are many. To start with the entire movie is stagnant. It just does not seem to move. The characterization is weak, in fact it is not there at all. To start with, why is Raavan the way he is? What is the type of relationship between Ram and Sita? Sita considers him to be God (Ram is even named Dev in the movie!) they are shown in the flashback having some romantic moments. How come Ram suspects the her fidelity? Just because this is mentioned in some versions of the Ramayana does not give the director the license to do so. The story of Ram is one which every Indian (especially North Indian) has grown up with. For him (or her) it is plain and simple. Ram is good, Raavan is bad, and Sita is virtuous. And this is inviolate. Unless there is extremely strong evidence to the contrary. Mani Ratnam seems to have forgotten this and paints Ram as a villain, Raavan as a semi-hero and Sita is dangling between her love for her captor and the role she has to play as a traditional Hindu wife to Ram. And that to me seems to me the major problem with the movie, Mani Ratnam has not internalized the Indian ethos. One could go on and on and skewer the movie even more. But what is the point, the damage has been done, both to Mani Ratnam’s depleting reputation and to my pocket! Mani Ratnam could have done well to make his film a psycho-drama on Stockholm Syndrome, the kidnapped woman having positive vibes for her captor. It had all the ingredients for this, right from the very start. But unfortunately, he lost his way in the mayhem the movie is. Abhishek Bachchan is a non-actor, we all know it, but what we did not know is the extent to which he could ham. But why blame AB Jr., poor chap, that is how the director conceived his role. Aishwarya looks pretty. Even her injuries are designed to make her look like Miss World. Vikram maybe a super star in South, but in this movie he is a one-dimensional cardboard character with the same frown on his moustachioed face through the movie. The actors who shine through are Ravi Kissen (Raavan’s henchman) and Priyamani (Raavan’s sister who got gang-raped in the police lock-up on the day she should have been having her suhag-raat). The one redeeming feature of the film is the breathtaking photography by Santosh Sivan. Kerala has never been photographed so well. The sweep of his camera takes us to the hills and valleys of this lovely state and also captures the rivulets and backwaters which flow through it. And those lovely Kerala monsoons! PS 1: On the way back, we had a bunch of distraught travelers (my family) on the way home. I tried to cheer my wife and even amuse the children by offering to buy her a ticket to a repeat show of Raavan in case her fish curry was not good. She was not amused. PS 2: The fish curry was infinitely better than the movie, I can assure you that! Jai Ho, Kaptaan Wale ji! “So you refuse the prasad of Captain Baba?” the female devotee’s voice was stern. “Wait!” She went around Captain Baba’s grave. But she could not find among the offerings left behind by the devotees any prasad which I could “use”. The old man sitting on the parapet wall around the mazaar of Captain Baba had consumed the only usable offering. She seemed a bit dejected when she returned. But she had alternate prasad in her hands when she turned around to face me. Said she, in her stern voice, “Yeh lo”. And she placed into my outstretched palm one piece of revdi and a small vial of itr. “Yeh raha tumhara prasad. Lo”, she said triumphantly. She stared at me for a few seconds and then walked away. 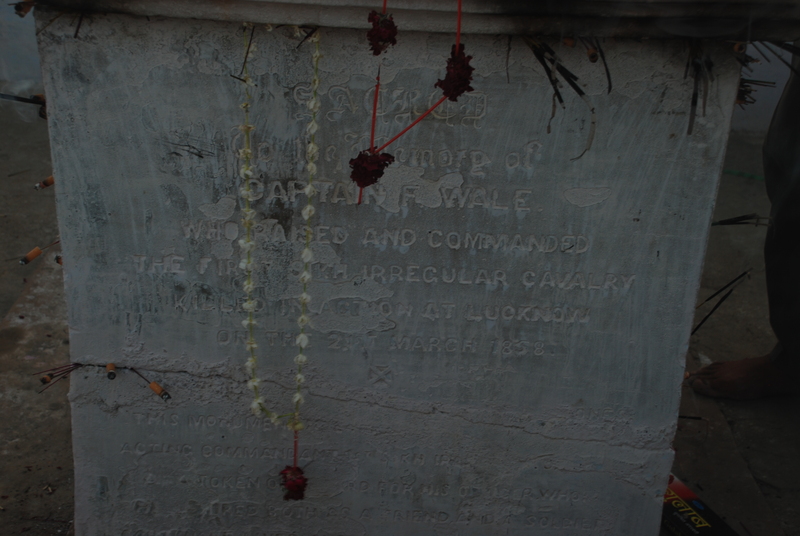 We were at the grave of Capt F. Wale of British Army in India who raised and commanded the First Sikh Irregular Cavalry. The “prasad” which she had originally offered me was a cigarette. I was visiting Lucknow on work. I had a couple of hours to spare after business was done and I asked my dear friend, Anshu, to drive me to Captain Baba’s mazaar at Moosa Bagh which lies some 20-25 kilometers outside the city. Anshu, a long-term resident of Lucknow, had never been to the mazaar, though he had vaguely heard about it. Mazaar is Persian for a saint’s grave. We drive through the Chowk area of old Lucknow then southwards onto Hardoi road. From there a right turn on to Sitapur Road for a bumpy ride driving along for some twenty minutes avoiding cattle, cyclists and local villagers. 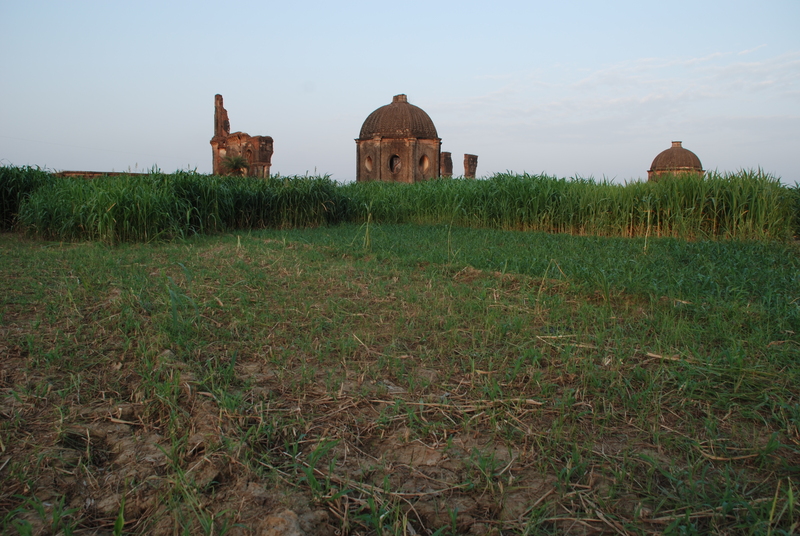 We pass through a village and a left turn on a dust track takes us to the Moosa Bagh fort, or what remains of the fort. This must have been a handsome fort though with the ravages of time it is reduced to sections of walls and some domes. Anshu parks his car off the dust track and we start walking up to the mazaar. There is a bit of a crowd there with the usual trappings of a small mela. Stalls selling trinkets, juice-wallahs, food stalls. Burqa-clad women and bawling kids. As we get closer to the mazaar we realize that this was not the one we had come seeking. This mazaar is of some sufi saint’s and not Captain Baba’s. A helpful local directs us to our destination which lies right behind this one in a patch of grassy fields. We walk through the fields-lush with crop grown as fodder for cattle- via a narrow pathway. A hundred meters or so, and we are at Captain Baba’s mazaar. Lucknow was the capital of Avadh, also known as Oudh. Oudh was regarded as a center for culture in 18th and 19th century. It also played an important role in the first war of independence in 1857. (Remember Satyajit Ray’s “Shatranj ke Khiladi”?) After the British under Outram vanquished the Nawaab of Oudh, some of the Nawaab’s troops holed up in the fort of Moosa Bagh which adjoined the residence of Ali Nakki Khan, a minister of the deposed Nawaab. The final assault was on 19th March, 1858. The Oudh forces offered little resistance the British victory here ensured that Oudh was now totally in control. The only remarkable thing about this battle was that Capt F. Wale, who switched sides and fought along the Oudh Nawaab’s army against his own people, the British! At least this is what common folklore says. There is no documented evidence to support this story. But what is a fact that a regiment of Sikhs was indeed sent to secure the place. Maybe the good Captain, who raised the First Sikh Irregular Cavalry, broke away and joined the Oudh forces. Who knows! The legend also has it that the Captain was in love with his smokes and he went down fighting, with a cigarette on his lips. I suppose this whole story of a white sahib fighting on behalf of the Indians against his own people would have made him a hero among the local populace. The cigarette dangling from his lips as he rode his horse charging into the British army, maybe the men of the same First Sikh Irregular Cavalry which he personally raised, added to the charisma. And in death, he became the epitome of sacrifice for the villagers. Overtime Captain Baba was attributed with all kinds of magical powers. The grave became a mazaar, drawing people from all across his grave. The grave itself appears unremarkable as we approach it fighting our way through the thick outcrop in the fields. The open-air structure is in urgent need of repairs, the horizontal slab rather loose and cracks among the edges of the vertical walls. 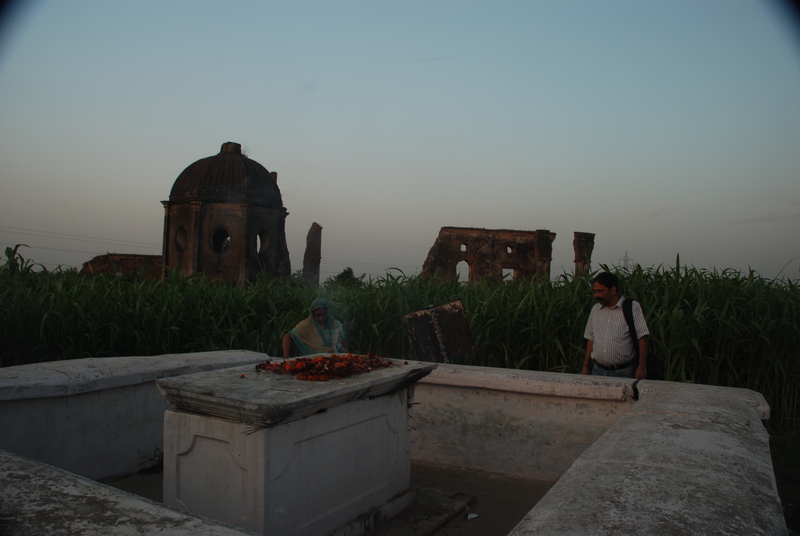 The grave is enclosed within a parapet wall and we see a dhoti-clad old man sitting atop it. As Anshu goes around taking shots with his camera, I am left alone with Captain Baba. Not really alone. That old dhoti-clad guy is hanging around on the parapet and there is a constant stream of devotees. Both Hindus and Muslims. They place their offerings on the mazaar, and kneel. Some even break-down overcome by their emotions. Captain Baba does have powers! The most common offering is a cigarette. The devotee take a cigarette from a pack and offer a lit one to Captain Baba. Of course they do not light the stick in the usual manner- placing the cigarette to their lips. It is lit by holding the cigarette with one hand and with igniting the end with a lit matchstick, in the manner agarbattis are lit for pujas. The cigarette is then stuck into a crevice in the grave. All along its walls, and even between the walls and the horizontal slab. These are not the only offerings, there are the ubiquitous agarbattis and small vials of itr, a very popular offering in this part of the country. 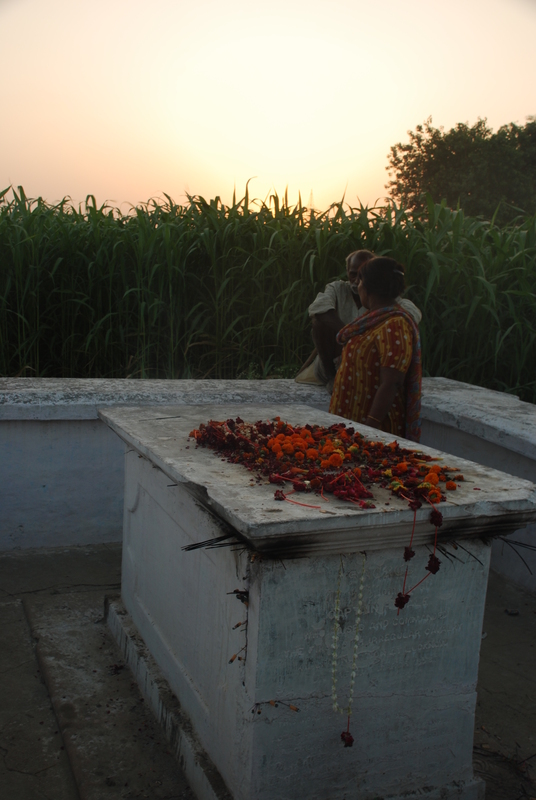 The ground around the grave is littered with empty packs of cigarettes and agarbattis. I see a burly man taking off his chappals and walking into the sanctum sanctorum. He is panting heavily, perhaps he is asthmatic. He has a Malkhan Singh like moustache, narrow above his lips and broadening and thickening as it flows outwards on his cheeks. I assume he is a Muslim. He is followed by a salwaar-kameez clad lady. Must be his wife, I think. Then I notice the thick sindoor mark in her maang. They were a Hindu couple. I walk up gingerly to him after he had finished his prayers. I am a bit scared of his built. I know that some men in these parts of India are happy to pull out their tamanchas (home-made pistols) and shoot down people just to amuse themselves. “Namaste”, I say. And I am on a lookout for his tamancha. He bows a little, touching his right hand to his chest. “Namaste”. I relax. After a few exchanges of Achhas and Jees, we get down to business. And he tells me his story. He has been visiting the mazaar every week for the last fifteen years. Sometimes out of his own volition and often summoned by “Baba” (“bulawaa aata hai unka”). I dare not ask him why Baba summons him, and his wife. There is an additional piece of information he volunteers. The day we were there was the first Thursday after the new moon and it was considered auspicious to visit the place that day. “Aaj Nauchandi hai, aana toh tha hi”, today is Nauchandi, one had to come, he says. No sooner the couple leaves arrives a woman, alone, carrying a bagful of offerings. She seems to be a regular here going by the greetings and smiles she exchanges with those hovering around. Anshu and I are watching the proceedings and I whisper to him, “What a sacrilege, not only I am not carrying offerings for Captain Baba, I am not even carrying a cigarette for myself. This was indeed strange, I was not carrying my pack of Classic Milds cigarette! And I also made the mistake of uttering this in Hindi. “Abhi laati hoon”, she offers. “Na, wahaan ka nahin”, I stutter, pointing to the cigarettes stuck into the grave. All cigarettes on the grave have been reduced to their stubs, the fresh one has been appropriated by the old man on the parapet wall. We return home clutching our pieces of revdi and vials of itr. Anshu, who shuns nicotine and I, who have been an ardent devotee of tobacco, return home with happy feelings. I suppose he is happy as he is not in the clutches of the addiction and I am happy that I have found my Guru now, Guru Capt F. Wale! If you have not grown up wearing your older sibling’s clothes, this post is not for you. If you are the older sibling, then perhaps you may have grown with your trouser folds getting lengthened by the friendly neighbourhood tailor who took job-work to unravel the bottom seams your trousers. Also called “alteration”. In the place I grew up in such gentlemen had painted boards outside their establishments announcing loudly in bold fluorescent colours: “Ultration”. If you have experienced neither, please do not continue; this post is not for you. One of my pet peeves as I was growing up was to wear clothes which my elder brother had discarded. There was nothing wrong with the garment- mind you- it is just that the thought of wearing my brother’s used clothing was abhorrent to me during those days of growing up. My teen angst was at full flow at this “injustice”. I would think of all the nasty things which I would do to my brother’s clothes just to avoid wearing them. I tried one of these nasty things once, I slashed with a shaving blade a tear along the length of the trouser. No avail, the tear got darned by the same alteration specialist. And the trouser was back with me again. If I ranted about the frayed collar, the alteration specialist would turn the collar around and make the shirt as good as new, or so he and my parents claimed. If you identify yourself with what I have just written, then perhaps this post is for you. I grew up in late 60’s and early 70’s when India was still in the clutches of Nehruvian socialism. It was the time when my father had to join a long waiting list for a watch, an HMT watch. When a Bajaj scooter meant a wait of at least eight to ten years before it was delivered. And more importantly, my father’s salary as a college teacher was not good enough to provide lavishly for the family. Supply in general was meager in the country those days, money backing the demand was even more scarce. Given the general mismatch between goods’ supply and ability to buy goods, recycling was the order of the day. Let us take for example the humble incandescent lamps which were the commonly used lighting accessories- fluorescent tubes (then called “Mercury light”, or “Markari lite” in the part of India I was growing up in) were not affordable. Hell broke loose when the lamp- called “bulb” colloquially- fused. Each member of the family would blame the other for this colossal disaster. “You have been switching this bulb on-and-off so very often” was the accusation. And then the eldest amongst us would be summoned to resolve the problem. The concerned would climb up to the bulb affixed on the wall socket. A study table would be arranged right under the errant bulb and a “stool” perched atop the table to facilitate ease of access. Multiple hands would hold the table as the rescuer clambered atop the stool and removed the fused bulb. He (it was always a he) would peer into the innards of the bulb and check if the filament was long enough to be fixed. He would shake the bulb around- a twist here and a rattle there- hoping the broken ends of the filament got realigned. There was a sigh of relief if he could manage this or a gasp if he finally declared that the filament was broken to pieces and there was no way that he could get the bulb working all over again. The “rescuer” would gingerly alight with a doleful look on his face, mindful of the general gloom prevalent in the crowd below. The crowd soon cheered up as they realized that they had found a new receptacle for their botanical pursuits, a planter. The top of the bulb was carefully decapitated to leave a gap between the- well- the bulb of the dead bulb. Water was filled in, a botanical specimen placed into this water-in-the-bulb and the bulb was suspended along the sides of the living room wall. What a lovely decoration for the drawing room! And the afore-mentioned plant was more often than not the creeper, “money-plant”. What an appropriate specimen to reflect the aspirations of a middle-class family! And when this planter failed, the bulb was used as a fodder for “manjha” for the kite sting. It was crushed to powder and added to the gooey mix which served a coating to the thread used to fly kites to give them their murderous edge. My school, run by Roman Catholic priests, had this periodic campaign to get the students to get old newspapers from home. The class which could get the maximum kilograms of newspapers would be declared the winner. And we would go around with fervor to collect as much as could for the benefit of the class. Sometimes the organizer would get creative and ask us to convert the newspapers into a packet. Our school was asking us not only to collect the paper but also to do some value-adding work with it viz. converting them to envelopes. A packet to dispense medicinal tablets in, for example. Now this is basic origami and we all were familiar with it. By the way, if you want to know what happened to the old newspapers, here is the answer; they all showed up as packets- called “thonga” in Jamshedpur- at the local grocer’s shop. That is, if they were not appropriated as text-book coverings. Old cotton sarees were recycled as bandages and swabs and much else. Empty plastic bags of milk were milked further to generate some additional revenue for the family. Remember those pouches stuck to the wall next to kitchen sink awaiting the local kabadi-waalah? Aluminum caps of milk bottles were used likewise. Used rubber bands from the mithai boxes from the local halwai (“sweet-marts” in my town) adorned the end of pencils and served as emergency erasers. Old shaving blades were used as pencil sharpeners. Old diaries as dhobi account books and old calendars as books coverings. Discarded clothes were handy in buying steel utensils. And the reverse of used envelopes served as rough paper. I am sure you can think of several other recycling stuff. What about the used- and utterly emaciated- bars of bathing soaps, “Jai”, Lux” “Rexona”, “Moti” and “Hamaam”? These were dutifully used as hand-cleansers after nature’s call. “Potty-soaps”, if you will! Unfortunately the one thing which cannot be recycled is the experience of living in those times! You are currently browsing the Santosh Ojha's Weblog blog archives for June, 2010.